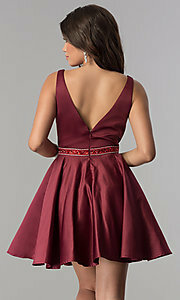 Gleaming satin and rhinestones make this short burgundy homecoming dress an elegant option for your semi-formal event. The lovely a-line party dress has tonal beading and eye-catching sequins at the natural waistline that are sure to sparkle under the lights. The fitted v-neck bodice includes an illusion inset for added stability while satin straps round the shoulders to frame the low v-back detail. A tulle lining adds fullness and a youthful look to the short circle skirt that seems destined for the dance floor. Ideal for wedding receptions or hoco 2019, this affordable short burgundy red homecoming dress, under $100, is a fresh style with shimmering accents.